I was in California recently for WP Elevation’s mastermind and live public events. Being in such proximity to Kim Doyal, I couldn’t pass up the opportunity to invite her to join me on the podcast for a record third visit. Kim Doyal is someone who is driven by passion. That’s how she initially got wrapped up in the world of WordPress and why she built a business around it 11 years ago. The problem is, she didn’t come from a web development or design background, which made it difficult to stay connected to what she describes as this “incestuous” community. She probably has a point, which is why she was right to look outside WordPress for inspirational sources. Fast forward five years and Kim found herself a new love in content marketing. It’s not at all strange to decide to change direction in your business, especially if you encounter a subset of it that brings you more joy than anything else. For Kim, that came in the form of content marketing. That’s not the only thing she’s been involved in since making the pivot from The WordPress Chick to Kim Doyal. As Kim worked her way deeper into the content marketing space, she decided to launch a segmentation software with a business partner. Unfortunately, the project was a failure. Don’t charge into something new with the mindset of: Ready, Aim, Fire. Instead, take your time with: Aim, Ready, Fire. Life can get in the way of even the best laid plans. Between her personal life upheavals and her partner’s bouts with illness, it took about a year-and-a-half for the SaaS to come to fruition. The UI didn’t meet Kim’s expectations and wasn’t something she wanted to put her name on in the end. And she attributes the failure to her lack of understanding about what she needed to do to get it off the ground. SaaS requires a long-term commitment to which you have to be fanatically involved. And she wanted nothing to do with project management. In addition, she and her partner just weren’t on the same page and the growing silence between them didn’t help. Kim is a well-known figure in both the WordPress and content marketing spaces. As you can imagine, this failure was not one she could keep to herself. Instead of hiding away or lying about the situation, Kim was honest about the failed product. She went to her podcast and told the story of what happened. Then, be ready to dust yourself and start again. Did you know that Kim’s background is in art? Last year, as she attempted to reconnect with her roots, she fell in love with pen and paper again. While working on mapping out a strategy for her personal brand with a bullet journal, she took some pictures of what she’d done, shared it with her group and found that other people were excited about it. Despite a failed attempt to raise money through Kickstarter, Kim was able to launch a pre-sales system for the new product at the end of 2018. With money coming in, and a new topic for her podcast, she’s generated a lot of momentum leading up to the launch. Kim’s new product is called the Content Creators Planner and, if you can believe this, it’s a paper planner. What kind of content can you create to support them? How will you use this content to generate leads or convert? Users develop monthly campaigns that support their business and revenue generation goals instead of just putting something on social media or email for the sake of doing marketing. They can also use it to track their progress through sales and traffic statistics. What’s so refreshing about an interview like this is Kim’s willingness to talk about the kinds of things that others might feel ashamed to discuss with others. But her journey is no different from what most business owners have gone through. It might not be in the marketing or product development realms, but all of our careers have had their ebbs and flows as we sort out what it is we’re truly meant to do. That said, if you want to cut down on the chances of failure creeping into your WordPress consultant business, sign up for this online training now. You’ll learn how to start getting better fees, projects, and clients. You can reach out and thank Kim Doyal on her website. Stay in touch with Kim and tune into her podcast. 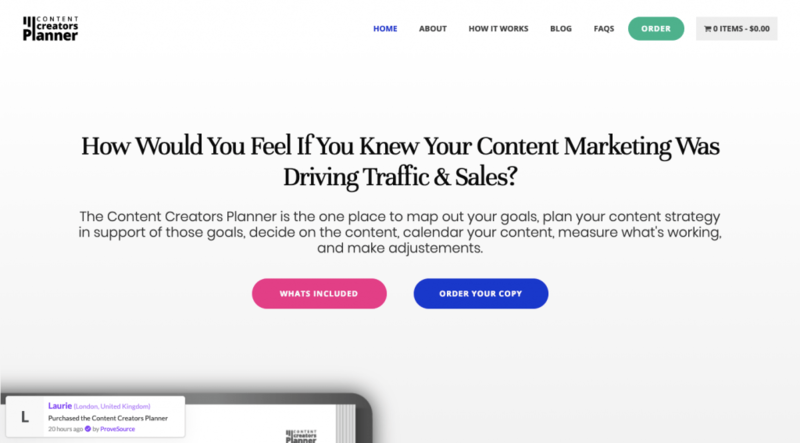 Check out the Content Creators Planner. Join the Content Creators Facebook group for more content marketing insights.